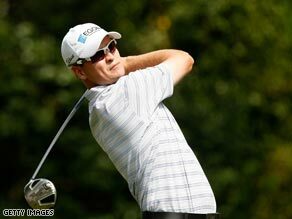 (CNN) -- Zach Johnson secured a four-under 68 to grab a two-stroke lead entering the final round of the $6.4 million Quail Hollow Championship. Johnson took advantage of Tiger Woods' late bogeys to lead by two strokes in the Quail Hollow event. Johnson, the 2007 Masters champion, ended on an 11-under 205, two ahead of Tiger Woods. The world number one, who is chasing his second win of this year, hit two late bogeys on his way to a two-under 70. He was tied at nine-under 207 with fellow Americans Lucas Glover (68) and George McNeill (70). "I've got a two-shot lead. I'm happy to be there," Johnson said. "At the same time, on this golf course, that's a matter of one hole. Maybe even one shot." "I didn't get off to the start I necessarily wanted but I remained patient and I think that was the key for me today," he said, according to Reuters.com. "The tee shot I hit on (the par-three sixth hole) really calmed me down and that birdie propelled me the rest of the day." "I'm happy to be (leading) but at the same time I don't want to get overly complacent."